For more than a century, The Wind in the Willows and its endearing protagonists–Mole, Mr. Toad, Badger, and Ratty–have enchanted children of all ages. Whether the four friends are setting forth on an exciting adventure, engaging in a comic caper, or simply relaxing by the River Thames, their stories are among the most charming in all English literature. The Wind in the Willows is an old but dearly loved classic. It starts with Mole, who upon spring cleaning decided to leave his task (and consequently his old life) and crawls to the surface. He soon discovers the wonders of the Nature and the River. Meeting with Water Rat the two quickly become friends and Mole settles into the life at the Riverbank. The book is essentially a collection of events and trials that the two animals and their friends face. As a child I had seen the movie (1996) several times and I believe it was one of my favourites. Opening this book and reading the first lines I was brought back memories from 10 years away, and I could see the movie scenes in my head. For a while I was confused whether I actually liked the book or if I was simply enthralled by nostalgia. But the more I read, the more I fell in love with Kenneth Grahame’s way of storytelling. He has a very descriptive style that engages all the senses; the language is wonderful poetry at best. The fact that this book was first published in 1908 shows that though over 100 years have passed, the story still captures the readers attention. It is a children’s book which means there is a handful of moral thrown in the mix. And still, somethings don’t quite match. (I hope that you have read the book or know the story so this won’t come as a spoiler to you). For example the Toad’s escape from the jail is left unpunished – fair, he was sentenced for 20 years for stealing a car and causing ruckus, but the police force is definitely the on the “bad side” of the system. And then there is the Toad’s sudden change of heart which feels (and felt even 10 years ago) strange. All in all Wind in the Willows is a wonderful book which captures its reader and doesn’t let go until the final page has been turned. For a uni student such as myself it is escapism at its best. The edition that I’ve linked here is illustrated by Inga Moore, but mine was illustrated by Ernest H. Shepard (who I believe is more famous from his Winnie-the-Pooh illustrations). 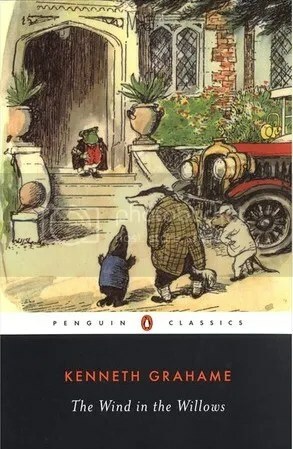 This entry was posted in Book reviews and tagged book review, classics, kenneth grahame, TBR 274, The Wind in the Willows by Noora. Bookmark the permalink.